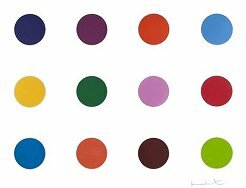 The fact that he achieved an 'E' grade in art A-level and was initially refused a place at Goldsmiths College arguably makes Damien Hirst's vast array of incredible achievements even more astonishing. The internationally renowned artist, entrepreneur and art collector was born in Bristol in 1965 and spend his childhood in Leeds, where his art career got off to a questionable start. After flunking his A-levels and initially being refused admission to a number of institutions, he eventually graduated from Goldsmiths, University of London in 1989 with a degree in Fine Art. A student placement at a mortuary characterised his future artistic themes and materials, with Hirst rising to fame after creating a series of artworks exhibiting dead animals preserved in formaldehyde. British businessman Charles Saatchi funded The Physical Impossibility of Death in the Mind of Someone Living, a shark in formaldehyde in a vitrine which sold for £50,000. The work was showcased in the first Young British Artists (YBA) exhibition in 1992, a group which dominated the UK art scene during the 90s. Hirst's decision to sell a complete show at Sotheby's by auction raised a staggering £111mn, smashing the record for a single artist auction and his personal record of £10.3mn for The Golden Calf, an animal adorned with 18-carat hooves and horns and preserved in formaldehyde. Hirst is reportedly Britain's most affluent living artist with an estimated wealth of over £215mn. 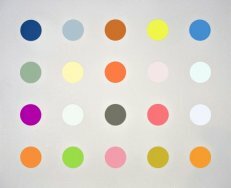 Hirst, who is arguably the most celebrated member of the YBA, won the Turner Prize in 1995. He has organised countless exhibitions both group and solo, published art books and an autobiography and designed album artwork for artists including Babyshambles. His most recent achievements include creating the colossal Union Jack on the arena floor for the London 2012 Olympics closing ceremony and designing the award statue for the 2013 Brits. © If artwork shown on ArtFair is already sold or unavailable for immediate sale, we'll do our utmost to source a similar edition for you. ArtFair is a trading name of LeadFair Ltd. Co. Reg. Number 08565869. Reg. Address: Swift House, 18 Hoffmans Way, Chelmsford, Essex. CM1 1GU. Registered in England and Wales. VAT Reg. No. 169725662. Registered with the Information Commissioner's Office: Data Protection Reg. No. ZA025012. Artwork prices can go up or down. ArtFair offers fine art, contemporary art, urban art, pop art, and modern art through our own collection and our global network of art gallery partners, art dealers and private collections. 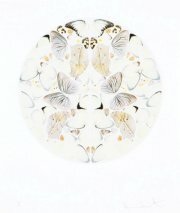 Keywords: DamianHirst, Damien Hirst, Damian Hurst, Tyloxapol, Damien Hirst Art For Sale.